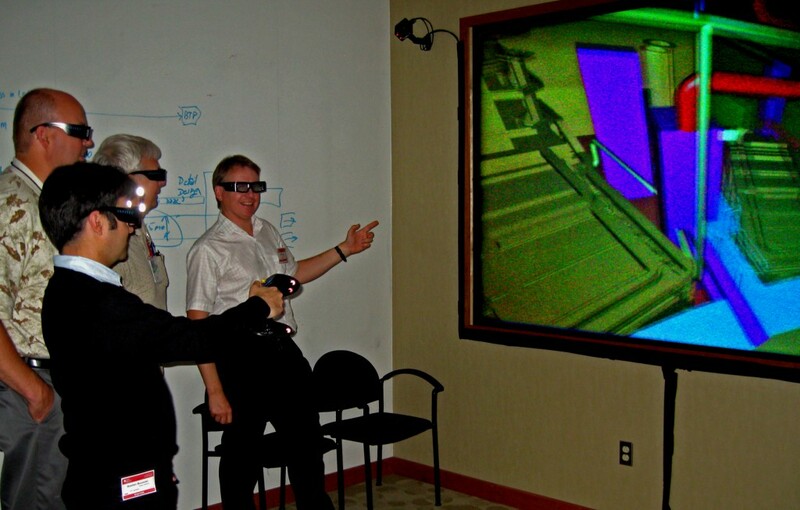 ITER Vacuum Group members Robert Pearce (right) and Bastien Boussier (front) with their US colleagues Walter Gardner and Rodger Moon taking a virtual walk through ITER's piping system. The ITER Vacuum Group members recently met with their US colleagues in Oak Ridge in order to progress the design and routing of the 30 kilometres of vacuum piping in the ITER Tokamak Complex. One option currently being trialled by the US Domestic Agency is the use of a 3D virtual reality tool to route piping through the Tokamak Complex. Viewed through glasses with different coloured lenses, the ITER CAD models turned into a 3D world which could be walked through as if at a theme park. US lead vacuum engineer Walt Gardner stated that "such tools would really help in the massive amount of integration that is required."